Driving with damaged and worn tires in your used car, UAE is not just uncomfortable, it can also be downright dangerous. Unbalanced wheels take a toll on your tires and can cause further problems down the road. 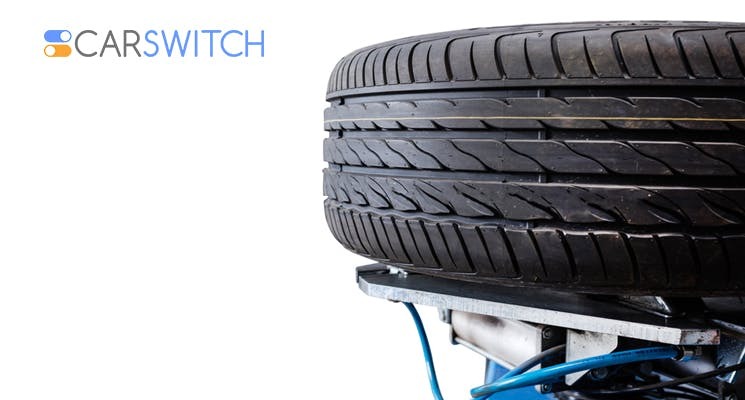 That’s why the experts at CarSwitch highly recommend to keep your wheels aligned and to check the wheel balance regularly. What Exactly Is Wheel Balancing? It is the process of balancing the weight of the tire and the wheel assembly so that the rim and tire are in harmony. The idea is to ensure that the weight of the tire is distributed evenly. When the wheels are balanced, they will spin evenly without causing any vibrations. Why You Should Avoid Driving With Unbalanced Wheels? The importance of wheel alignment should never be undermined. Unbalanced wheels often cause vibration, and this can make it difficult for you to handle your used car, UAE and drive it properly. Unbalanced wheels might also cause the floorboard and seat to vibrate, making your journey uncomfortable. You may also notice your car swerve from side to side while you are driving down a straight road when your wheels are unbalanced. Moreover, you will feel every rock on the road. Apart from that, you might notice vibration in the steering wheel and it might also feel loose. Unbalanced wheels also put a strain on the wheel bearings and suspension. So, it might not be a good idea to delay maintenance, as you can end up racking a much larger bill. Even if you are a steady driver, it is very difficult to prevent your tires in your used car UAE from going out of balance as it doesn’t take much for that to happen. Cracks in the rubber, imperfections, and damage to a rim or tire are some of the things that can make a tire go out of balance. What this essentially means is that one portion of the rim or the tire becomes heavier than other sections. This is especially noticeable when you are driving at higher speeds, as you might notice your steering wheel vibrating. What To Do If You Feel Your Tires Are Unbalanced? You can easily get a wheel balancing service. It is a simple and inexpensive process. What happens is that one wheel is removed from your car at a time and put on a computerized machine. The machine then spins the tire around to find out which side is the heaviest. Once that’s determined, a small lead weight is attached to the tire to counterbalance the heavy spots. The machine is able to spin the wheel easily when the weight is the same on all sides. If you are confused about whether your car needs a wheel balancing or alignment, it is best to visit a tire service shop and get a professional to examine your car. Do you want to buy a used car, UAE or sell your car but are short on time? Visit CarSwitch.com today and let us handle the process for you while you sit back and relax. Happy shopping! Looking to buy a car in Dubai, UAE and hoping you can finance it through a.